The history of man-made tunnels extends nearly as far back as that of human civilization. The reason for this is plain. Almost any concentration of people will necessitate the existence of tunnels. Without tunnels, an effective sewage or irrigation system is radically more difficult to accomplish. For example, today in Iran there exist the Qanats of Goanabad, a water management system involving rudimentary tunnels built approximately between 700 BCE and 500 BCE. Stunningly, these tunnels still function as a source of water for around 40,000 people. Tunnels are integral to the operations of and between cities. Modern tunnels functioning for water management, irrigation, sewage distribution, commercial delivery of goods or transportation of people are much like street roads, highways, surface railways, and sea lanes: arteries conducive to vital human activity and human flourishing. In addition to industrial practicality, tunnels can offer myriad social benefits. A new movement to reclaim socially valuable urban space for pedestrians has moved several city-dividing surface highways underground into tunnel highways. I have family that lives in Madrid, in a neighborhood that once abutted a noisy and pollution-spewing highway. 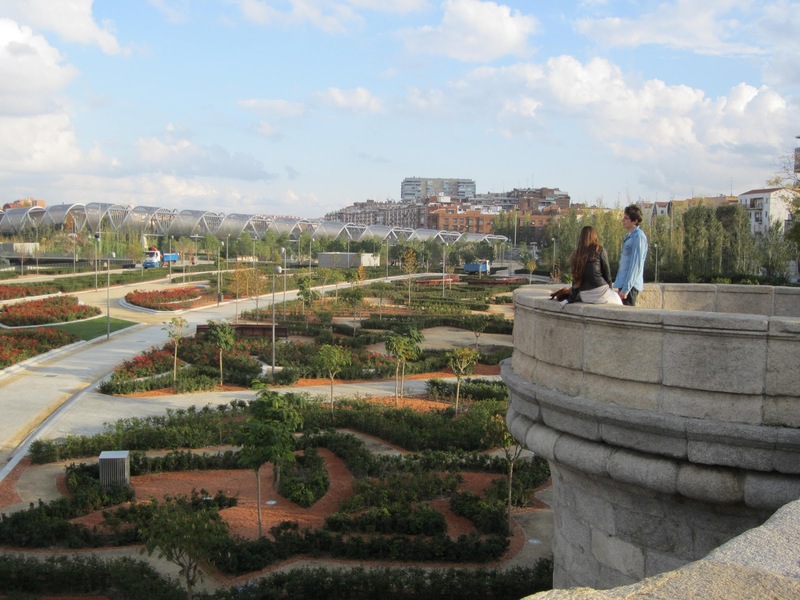 However, in 2011, the city of Madrid finished moving the M-30 highway underground and converting the above space into a marvelous riverfront park. Too often city neighborhoods are divided by highways with one side more affluent and the other being shut off from the livability standards affluence entails. Tunneling can help remedy this injustice. A good tunnel is defined by a series of crucial aspects. These include being impermeable to water and other outside elements, as well as being generally safe and having points of egress. 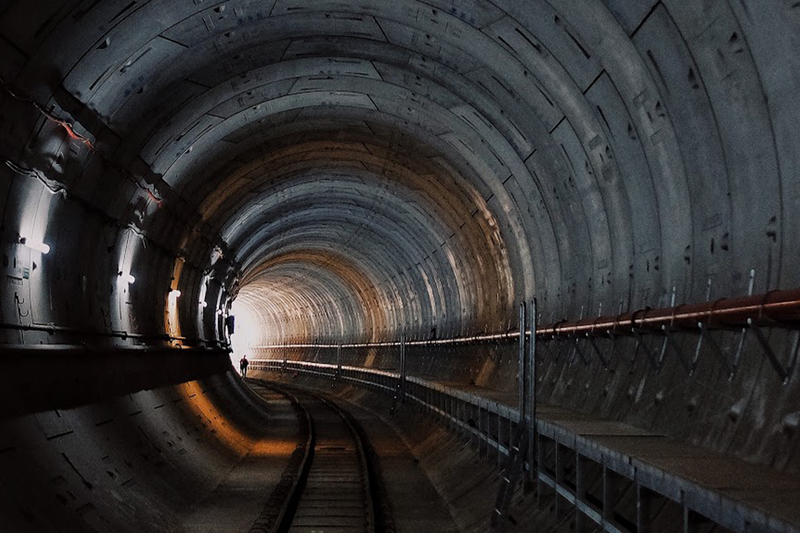 Before a tunnel is constructed, there needs to be a suitable geotechnical investigation and design stage to determine how a tunnel will comport with the geological conditions in place. Moreover, it must be ensured that a tunnel is protected against geological events such as an earthquake or tremor. A proper tunnel should have a long service life and minimum maintenance requirements. Finally, a tunnel must have minimal impact on the environment during construction and operation. While there are many ways by which civil engineers can fashion a tunnel, there are two basic methods for non-underwater tunnels: cut-and-cover and boring. Both methods are straightforward. Cut-and-cover generally applies to shallow tunnels. Workers and machines excavate a trench and roof over it according to the load they expect it to bear going forward. Cut-and-cover tunnels can be built in either top-down or bottom-up method depending on whether it is better to excavate first or build the support walls and capping beams from the ground level first. Most older metro lines were built using cut-and-cover. Cut-and-cover tunneling is less expensive than boring but far more disruptive at the surface level. Currently, the more common way to construct tunnels is a tunnel boring machine (TBM). A TBM is a cylindrical machine with a cross section designed to cut through many types of soil and rock. TBMs can range in size from 1 meter in diameter to nearly 18 meters in diameter; the largest TBM in the world is Big Bertha at 17.6 meters in diameter (which recently completed tunneling underneath Seattle). TBMs have a long history, beginning as a 19th century invention. The first TBM was designed in the 1840s for the purpose of digging a rail tunnel in the Italian Alps. The first TBM in the United States played a small role in the construction of the Hoosac Tunnel in the 1850s in Western Massachusetts. In most instances in the 19th century, TBM designs offered great promise but few practical upsides. These TBMs broke down easily and were rarely capable of digging significant distances. Nevertheless, the boring process was refined and began to pay efficiency dividends in the 20th century. The process continues to be improved upon, with innovations taking place in the last decade. For example, the TBMs used for the aforementioned Madrid Rio project (manufactured by Herrenknecht AG) were the then largest in the world with a maximum excavation diameter of 15.2 meters. Built a few years later, Big Bertha is 15% larger than those TBMs. Modern TBMs do more than just dig the tunnel; they are self contained tunnel building factories. As they dig, they fit reinforced pre-cast concrete panels into place to build the tunnel walls. 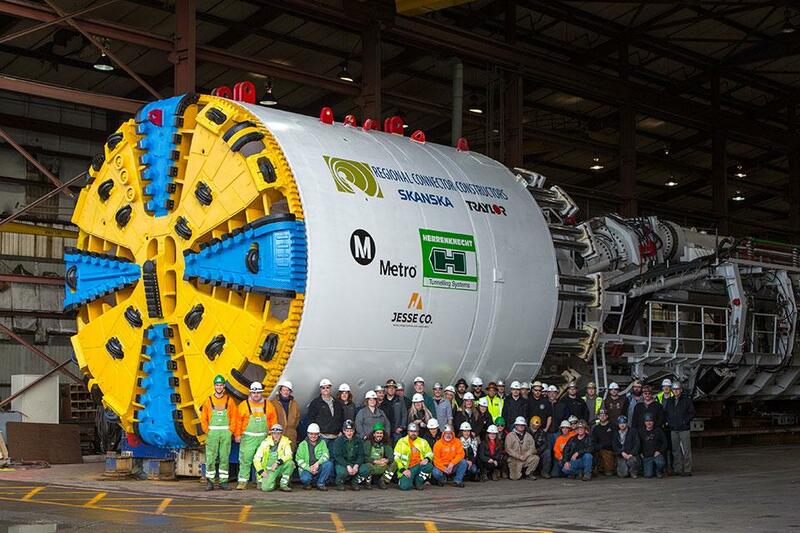 Today’s TBMs build tunnels at a much faster pace than years prior. In addition, these TBMs can limit vibrations so as to leave the communities under which tunneling is taking place completely unaffected and unperturbed. Washington, DC area residents might be familiar with the DC Clean Rivers Project. It is an ongoing infrastructure project aimed at reducing combined sewer overflows “into the District’s waterways – the Anacostia and Potomac Rivers and Rock Creek.” The program is “designed to capture and clean wastewater during rainfalls before it ever reaches our rivers.” When the project is completed in a few short years, the Anacostia River may even be swimmable (bringing much needed relief to DC residents during the hot and humid summer months much like the Tidal Basin once did a century ago). For this project to come to fruition, a huge amount of tunneling is required. Rather than having sewage water directly discharge into DC’s rivers, new tunnels will carry the combined sewer overflows to the already-existing state-of-the-art Blue Plains Wastewater Treatment Plant in Southwest DC. In fact, TBM Nannie (named after District educator Nannie Helen Burroughs) completed a first phase of the tunneling in November 2016. 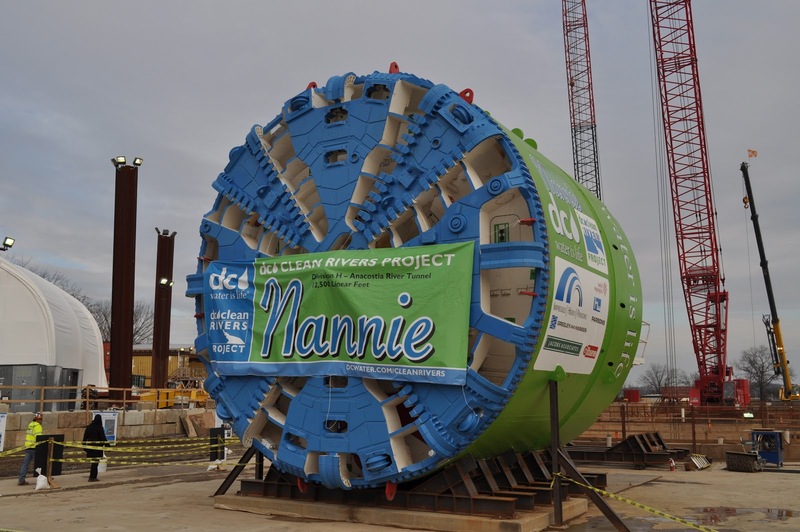 In one year of work averaging 39 feet per day, Nannie helped dig the Anacostia River Tunnel spanning from RFK Stadium to Poplar Point where it connects to the Blue Plains Tunnel. Nannie mined predominantly through stiff clay and beneath sensitive structures with minimal disruption to area residents and businesses. The new Anacostia River Tunnel is 80 to 120 feet deep, 12,500 feet long, and 23 feet in diameter. Since its opening, the Anacostia River Tunnel has already beaten projections by keeping three billion gallons of combined sewage overflows, as well as 150 tons of trash, out of the Anacostia River. Two other notable and ambitious tunneling projects around the world are Crossrail in London and Line 9 of the Barcelona Metro. Crossrail is a 73-mile railway under construction in London and adjoining counties. It includes London’s 12th “Tube” line, the Elizabeth Line. The Elizabeth Line, named after Queen Elizabeth II, is expected to fully open in 2019. Elizabeth will serve 41 stations in an East-West span linking Essex and Berkshire passing through London. In order to complete the Elizabeth Line, the company taking on this infrastructure project, Crossrail Ltd., utilized eight TBMs with twin-bore tunnels at 130 feet below ground. Additionally, Crossrail Ltd. successfully mined beneath sensitive structures, existing tunnels, sewers, and even archeological sites. A notable feat during this project, Crossrail’s threading “the eye of the needle.” Crossrail squeezed a TBM through the existing busy Tottenham Court Road station, passing mere inches above the crowded and fully functioning Northern Line platforms and inches below the station’s escalators. The completion of the Elizabeth Line and its 13-mile underground span beneath London is an engineering marvel. When completed, Line 9 of the Barcelona Metro will be the longest automatic train operation in Europe at 30 miles long, 27.3 miles of which will be underground. At over 200 feet below ground, Line 9 will be the deepest line of the Barcelona Metro network. Successfully tunneling under sensitive University of Barcelona facilities, parks, hospitals, historic buildings, and residential areas, Line 9 will also save costs and rider wait times through an innovative tunnel configuration. With 39 foot diameter tunnels, Line 9 will consist of a single tunnel with a novel two-level solution. Projet Montreal in Canada has proposed similar tunnels for its planned Pink Line for the city. 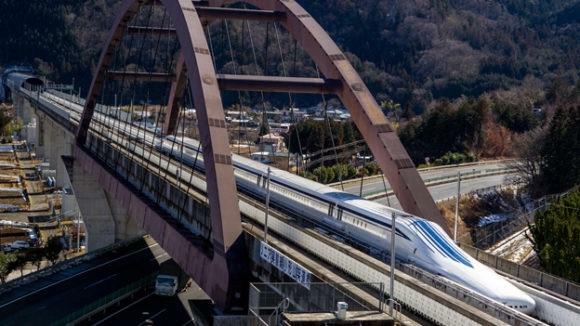 Deployment of ultra-fast Japanese superconducting maglev train technology along the Northeast Corridor will make an initial 15-minute trip from Baltimore to Washington, DC possible within the next decade, all while creating tens of thousands of infrastructure jobs. The developer of the project (BWRR) emphasizes the importance of identifying and using land in a manner that will minimize any negative impacts to landowners during both construction and operation. 311 MPH travel requires and relatively straight alignment to provide a comfortable and safe ride. Thus, for operational purposes, approximately 75 percent of the route will be in deep tunnels underground. Seven or eight TBMs with a diameter of 50 feet will drill 30 miles of tunnel, 80 to 150 feet underground. The majority of the remaining route will be on viaduct. Surface impacts, whether below ground or above ground, will be designed to be minimized. When it comes to public transit, tunnels are safe and mitigate surface impacts, and provide a means to deploy unparalleled speed. So with speed, safety, and smartly engineered tunnels, superconducting maglev train technology offers the possibility of the most exciting travel ever devised along the Northeast Corridor.